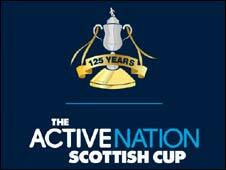 Montrose eased past Banks O'Dee to book their place in round three of the Active Nation Scottish Cup. The Gable Endies broke the deadlock after 57 minutes when Paul Watson's shot deflected past home goalkeeper Grant Pennant. It was two after 78 minutes when Watson provided a cutback for Aaron Sinclair, who fired high into the net. Watson was involved again in the third as he headed the ball on for Alan Campbell to nod home in injury time. Inverurie Loco Works: Reid, Park, Buchan, Wilson, Merriman, Morrison (Cormie 61), Singer, Ross, Djahansovzi, Gauld (Broadhurst 72), McLean. Subs Not Used: Neill, Bisset, Ainsley. Goals: Singer 17, Gauld 65. Stranraer: David Mitchell, Glen Mitchell, Sharp, Agostini, Henderson, Donald (Montgomerie 69), McGeouch (Jones 75), Danny Mitchell, Moore, Jack, Noble. Subs Not Used: Wright, Bouadji, Wight.